As per a new report, the Korean tech company is in talks with OEMs to bring its NFC-enabled payments service to non-Samsung premium Android smartphones. Samsung Pay might soon be headed to non-Samsung Android smartphones. 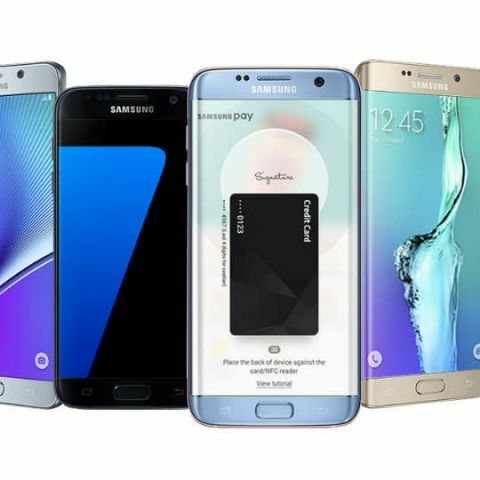 The company is believed to be in talks with other OEMs for integrating its NFC-based payments system in non-Samsung premium devices. As per the report, Samsung is discussing the expansion of Samsung Pay internally. The Korean tech company recently brought its payments service to its mid-range smartphones in the form of Samsung Pay Mini. The stripped down version of Samsung Pay offers support for UPI and Paytm, and unlike its full version, does not give users the ability to add debit/credit cards as payment methods. Both Samsung Pay and Samsung Pay Mini are compatible with with Point of Sale (PoS) terminals. Samsung had hinted at the availability of Samsung Pay and Samsung Pay Mini on other Android smartphones when it launched the Galaxy J7 Max in India. Currently, the full version of Samsung Pay is available in India on the Galaxy S8+, Galaxy S8, Galaxy S7 edge, Galaxy S7, Galaxy S6 edge+, Note 5, Galaxy A7 (2017), Galaxy A5 (2017), A5 (2016), A7 (2016), Galaxy A9 Pro and Galaxy J7 Pro. On the other hand Samsung Pay Mini is available on the Galaxy J7 Max, Galaxy On Max, Galaxy J7 Prime, Galaxy On Nxt and Galaxy J7 2016. While Samsung has clearly demarcated different territories for Samsung Pay and Samsung Pay Mini, the report suggest that the company may be looking to bring the full-fledged payments app to its mid-to-low range devices as well. If other OEMs have to integrate Samsung Pay into their smartphones, they will also have to upgrade their hardware to support the same. It is not yet clear how Samsung plans to convince manufacturers to do so, but more details are sure to emerge soon.